The dombra, also known as dombyra (Kazakh: домбыра) is a long-necked Kazakh lute and a musical string instrument. The dombyra shares certain characteristics with the komuz and dutar, such as its long, thin neck and oblong body shape. It is a popular instrument among Turkic communities in Central Asian countries such as Kazakhstan, Uzbekistan, Turkmenistan, Afghanistan, as well as Mongolia. The instrument differs slightly in different regions. The Kazakh dombyra has frets and is played by strumming with the hand or plucking each string individually, with an occasional tap on the main surface of the instrument. While the strings are traditionally made of sinew, modern dombras are usually produced using nylon strings. One of the greatest dombra players was the Kazakh folk musician and composer Kurmangazy Sagyrbayuly, who had a major influence on the development of Kazakh musical culture, including music for the dombra; his musical composition "Adai" is popular in Kazakhstan and abroad. In 2012 the elektrodombyra was created. The Turkestani and Badakhshani damburas are fretless with a body and neck carved from a single block of wood, usually mulberry or apricot. The dambura is played with much banging and scratching on the instrument to help give a percussive sound. The two strings are made of nylon (in modern times) or gut. They cross a short bridge to a pin at the other end of the body. There is a tiny sound hole in the back of the instrument, while the top is thick wood. It is not finished with any varnish, filing/sanding of any kind, and as with all other Turkic instruments there is some decoration. The Dumbyra is the equivalent instrument of the Volga Tatars and Bashkirs. A performer strikes all the strings at the same time. The upper string performs the bourdon tone and the lower string performs the melody. A dumbura is used as a solo as well as an ensemble instrument. The dombyra first appeared in the Middle Ages. For example, in works of Aby Nasyr Al-Farabi we can read about a tambur-like musical instrument similar to dombyra. Almost in every country of Central Asia was an instrument similar to the Dombyra. In the last century there where great composers and Dombyra players like Kurmangazy, Kazangap and Tattimbet. The Kazakh poet Abay Qunanbayuli is often shown holding a dombra at rest and many hold it in high regard as a symbol of nationalism among the post-Soviet nations of the Commonwealth of Independent States. The dombra is played by Erzhan Alimbetov in the Ulytau band. From the 12th to the 18th century, the dumbura was used by Bashkir sasans to accompany their poetic legends and kubairs. It is mentioned in the epic poem "Zayatulyak and Hiuhiliu". However, by the beginning of the 20th century, the dumbura was forgotten. The sasans were often the main ideologists of ethnic insurrections, so when the Russian administration put down an uprising, they punished the sasans and destroyed their dumburas. In the second half of the 20th century, several reconstructions were carried out. At present, the revivalist work continues. Among others, performer V. Shugayupov works on the revival of the dumbura. The modern wooden dumbura has a pear-shaped or an oval form. 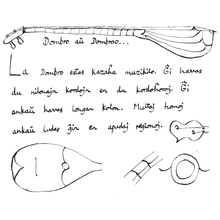 Dombra diagram, with description in Esperanto. This instrument has become a part of an Internet phenomenon after a video clip from SuperStar KZ, the Kazakh equivalent of the Idol series, was posted on YouTube. The video includes two contestants singing and a third one singing and playing the dombra (Ernar Kaldynov), which caused the popularity. The name of the original song is Freestailo by R.Lizer, a Kazakh man. Dombyra as an instrument is being popularized through Dombyra Parties, a flash mob-like movement of Kazakh youth organized via social media. The videos of Dombyra Party activities are shared on YouTube, Facebook etc. Many folk and regional tunings have existed, though below is the most accepted academic DG tuning for standard concert dombra prima of Kazakhstan. There are different classifications of Dombyra, for example Dombyra for singing songs or jirs has 8-9 strings, dombyra for kyus has more than 20 strings. Wikimedia Commons has media related to Dombra.